The composer Paisiello (1741-1816) was born in Taranto in Southern Italy. The Jesuits who educated him noticed that he was a gifted singer, and he received his first musical training from them. Admitted to the Conservatory of San Onofrio in Naples, he remained there for nine years. Called to Bologna and Modena to compose both comic and serious operas, he was soon working in Parma, Venice, and Rome, where he presented his charming Il Marchese di tulipano. By the age of thirty-six, the phenomenally prolific Paisiello had composed fifty-one operas. His principal rivals were Niccolo Piccinni and Domenico Cimarosa. Le due contesse and La disfatta di Dario, performed in Rome in 1777, established his position as Italy's foremost operatic composer. His music was characterized by its expressiveness and lushness of melody. That year Paisiello was invited to Saint Petersburg where Catherine II loaded him with favors. Among other operas composed by him at the Russian court were La serva padrona, La finta amante, and Il barbiere di Seviglia. Stanislas Poniatowski (see cat. no. 47) commissioned from him an oratorio, La Passione di Gesfi Cristo, and for the future Czarina Maria Feodorovna he composed several piano pieces. Before returning to Italy, he spent time in Vienna, and there he produced twelve symphonies and the delightful score, II re Teodoro. In 1785, Paisiello's opera L'amore ingegnioso was a failure when performed in Rome. Indignant, he settled at Naples where Ferdinando IV accorded him the post of Master of the Royal Chapel. When Vigee Le Brun met him, he had just composed Nina o la pazza d'amore (she attended its opening performance at the Teatro di San Carlo) and was in the process of completing a Te Deum for four voices and orchestra. The Te Deum celebrated the trip of Ferdinando and Maria Carolina to Vienna where they had arranged dynastic marriages for their children. In the present portrait, the scores of these two works are prominently displayed on the clavichord. When the Neapolitans successfully revolted against the reactionary Bourbon monarchy, Paisiello threw in his lot with the new government. Ferdinando returned from exile in Sicily, and during the period of reactionary repression that ensued, the composer fell into disgrace. In 1802 the First Consul Bonaparte summoned Paisiello to Paris to become the music director of his chapel, but Paisillo encountered fierce opposition from the Conservatoire in the persons of Mehul and Cherubini. For Napoleon's coronation, he wrote a mass and a Te Deum for two choirs and two orchestras. He returned to Italy in 1804, having enjoyed only minimal success in France. The King was dethroned and replaced by Napoleon's brother and brother-in-law, Joseph Bonaparte and Joachim Murat. During their successive reigns, Paisiello was liberally patronized, granted the Legion d'honneur and the directorship of the Naples Conservatory, but Ferdinando IV was reinstalled in 1815 at which time Paisiello was deprived of his major sources of income. Financially ruined, broken and forgotten, he died a year later. Vigee Le Brun relates some specific details about the sittings for this portrait, begun in December of 1790. The day before Christmas, she moved into an apartment near Naples. It was so cold that she and Paisiello had to blow into their hands to warm them. A fire was finally started, but the chimney was blocked and choking smoke filled the studio. "I do not understand," she wrote, "how I ever managed to finish this portrait" (Souvenirs, 11, 121). But finish it she did, and Menageot was able to report to d'Angiviller on March 30, 1791: "Mme Le Brun has returned [to Rome] from Naples. She has brought back the portrait she did of Paisiello which is a beautiful thing and far superior to the one she painted of herself [for the Uffizil last year." (A. de Montaiglon and J. Guiffrey, Correspondance des Directeurs de I'Acadgmie de France d Rome avec les Surintendants des Bdtiments, Paris, 1907, XVI, p. 16, document no. 9152). M6nageot allowed the portrait to accompany his large history painting Meleager when it was sent to Paris for the Salon of 1791 (see A. de Montaiglon and J. Guiffrey, op. cit., XVI, pp. 36-37, documents 9177, 9178). 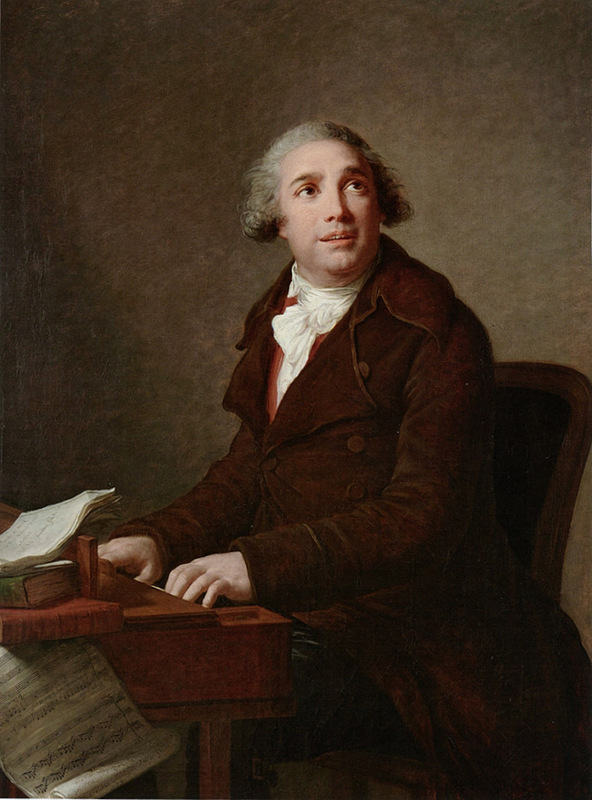 Of the multitude of portraits exhibited at the Salon, none aroused as much passionate admiration as the Paisiello. The author of La Bequille de Voltaire exclaimed: "Finally the portrait of Paesiello by Madame Le Brun! O Van Dyck, you are born again!." According to Les Petites Affiches, "Mde Le Brun has surpassed herself in the portrait of Paesiello ... especially with respect to its coloring and vivid effects. One cannot paint more brilliant flesh tones, a more harmonious background, nor clothing of a more powerful tonality." In his critical brochure entitled Le Sallon de Peinture, her own husband added his voice to the dithyrambic chorus of approval: "Noble composition, flawless draftsmanship, sublime expression, strength of harmony, and subtlety of tone. In a word, this is carrying art to its highest degree of perfection. The Ancients have left us nothing more perfect." If we can believe Vigee Le Brun, even Jacques Louis David, who at this time certainly bore her no love, paid her the ultimate male tribute: "[Paisiello] was hung in the Salon next to a portrait painted by David [Mine de Sorcy- Thellusson, now in Munich, Bayerische Staatsgemaldesammlungen], with which he was obviously not very pleased. Having approached my painting, he stared at it for a long while, then turning to several of his students and others who surrounded him: One would think, he said, that my portrait was painted by a woman and Paisiello by a man" (Souvenirs, 1, 264). The actual subject of the painting is Inspired Genius, a concept dear to the theoreticians of the Enlightenment and one that informs a significant number of works of art dating from the second half of the eighteenth century. Several of Fragonard's Portraits de fantaisie have genius or inspiration as their theme (Wildenstein 241, 253, 254), as does Houdon's bust of the charlatan Cagliostro (National Gallery of Art, Washington). A convincing argument can be made that Vigee Le Brun had studied those works prior to painting in 1788 her masterpiece, the Portrait of Hubert Robert (fig. 35). Of course, from the outset of her career, she specialized in rendering the sublime passions of the soul in her many tetes d'eypression (see cat. no. 55). Paisiello, dramatically poised at the clavichord and caught in the act of composing, his eyes mystically illuminated, was a ready-made subject. 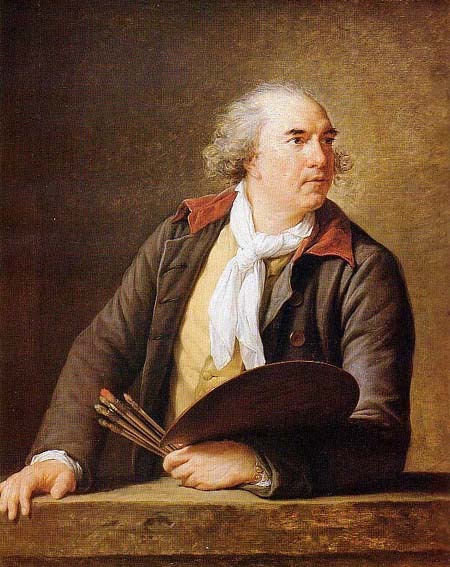 A. P. de Mirimonde was first to suggest, and correctly so, that the closest iconographic source of the composition is Duplessis's portrait of the German composer Christoph Willibald Gliick (Kunsthistorisches Museum, Vienna), which Mlle Vigee must surely have seen at the Salon of 1775 and had access to in 1791 in S. C. Miger's engraving. A curious anecdote bearing on Vigee Le Brun's reputation as a royalist at the height of the Revolution concerns a pastel replica or copy of the portrait of Paisiello. Along with her portrait of the Dauphin Louis Charles (Salon of 1789), this pastel was found in late May of 1794 hidden in the Dauphin's bedroom at the royal Chdteau de Saint Cloud. The painting bore a number of inscriptions honoring the Queen (by then Marie Antoinette had been guillotined) and her son, who was still imprisoned in the Temple. A special commission was appointed to investigate this as part of a monarchist plot. Among those implicated were the architect Richard Mique (later executed) and the artist's husband, Jean Baptiste Pierre Le Brun. One of the witnesses, Citizen Blesmard, testified that Le Brun had gone to Saint Cloud for the express purpose of removing the incriminating inscriptions from the portrait. According to the official report, Citizen Le Brun ... arrived around 2 o'clock. Invited by the respondent to come so that he might erase an anticivic inscription on the lower portion of a portrait of Pasielo [sic], an Italian musician, painted in pastel, which the Citizen respondent believes to be the original work of the Le Brun woman. Which inscription the respondent had noticed at the bottom of the aforesaid painting, since he was copying the head. This painting had been dedicated to the Queen to whom the inscriptions seem to be addressed. From what Citizen Le Brun told him ... [he] came here solely on account of the portrait of Paisiello ... (Original document, Paris, Archives Nationales, 02 489). Significantly, while the investigation was proceeding, Le Brun divorced his wife. The following copies, knee - or bust - length, have been recorded: 1) by G. Guillon Le Thiere, documented in Mrs. Flaxman's notebooks, British Museum (information kindly supplied by U. van de Sandt): "Sunday 13 March [1791, Rome]. I went to see le Thiers copy of M. [sic] le Brun's Portrait of Paisiello"; 2) pastel, ca. 1791, cited above; 3) Paris, Vente Dugazon, November 25-27, 1829, lot 17; 4) Paris, Vente anonyme, January 14, 1870, lot 116; 5) Paris, Vente anonyme, April 13, 1884, lot 4; 6) Paris, Vente du Comte de Reiset, January 30, 1922, lot 115; 7) formerly Bordes-Bonjean collection; then sold Paris, Hotel Drouot, June 21, 1924, lot 19; 8) Paris, Galerie Charpentier, Vente anonyme, May 12, 1950, lot 100; 9) formerly Gallerie Giovanni Pron, Turin; 10) formerly collection of E. Castelli, his sale, London, Christie's, November 27, 1970, lot 10; 11) Rouen, Palais des Consuls, Vente Andre Marie, November 5, 1975, lot 188 ( as by Jean Baptiste Pierre Le Brun), now in collection of He1ene Bucaille, Paris; 12) Paris, Palais Galliera, Vente anonyme, December 9, 1967, lot 29; 13) Paris, Hotel Drouot, Vente anonyme, December 9, 1968, lot 43; 14) drawing, attribtued to Jean Baptiste Isabey, sold Paris, Hotel Drouot, Veiite j. Dubois, March 7, 1901, lot 18; 16) oval miniature, Bedouret collection, Paris. ENGRAVINGS: Etienne Beisson after a drawing by Lefort; Johan Joseph Neidl, executed in Vienna, probably 1792-1795 (see exhibition catalogue, Diisseldorf, C. G. Boerner, Einladung zur Herbst - Aiisstellung, September 1-22, 1979, no. 298, illus.) Jacques Noel Fremy, for his Portraits des personnages remarqtiables dans tous les genres, 1, Paris, 1815, unnumbered plate. PROVENANCE: Collection of the artist, until 1842; bequeathed by her to the Musee Royal du Louvre along with the Portrait of the Artist Holding Her Daughter of 1786 and the Portrait Of Hubert Robert); the three paintings are effectively given to the museum by M. and Mme Justin Tripier Le Franc, in 1843; Musee du Louvre, until 1921; transferred to the Musee National de Versailles. EXHIBITIONS: Paris, Salon, 1791, no. 772; Paris, Galerie Le Brun, Exposition au profit des Grecs, 1826, no. 109; Paris, Musee d'Art et d'Essai, Palais de Tokyo, Portrait et societe en France (1715-1789), December 11, 1980 - September 1981, no number. SELECTED REFERENCES: Criticism of Salon of 1791, anthologized in Collection Deloynes (Paris, Bibliotheque Nationale, Cabinet des Estampes), XVII; No. 436 - [Philippe Cheryl, Explications et critiques impartiales..., p. 69; No. 438- La Biquille de Voltaire au Salon, pp. 38, 40; No. 441 - Lettres analitiques, critiques et philosophiques, p. 81; No 442 - [Jean Baptiste Pierre Le Brun], Le Sallon de Peinture, p. 10; No. 448 -M. Delacour, Response d'un peintre bordelois a la lettre de l'inconstant, n.p. ; No. 449 - Petites Affiches de Paris, p. 544; No. 450 - Abbe' de Fontenoy, "Lettre d'un artiste sur les ouvrages expos6s au Salon de 1791," journal G6n6ral de France, December 21, 1791, p. 582. See also Collection Deloynes, L, No. 1363 - Observations de M' Vilette sur 1'exposition des tableaux au Salon du Louvre, p. 829; Le Brun, 1793, p. 18; Souvenirs, I, 264, II, 119, 120-121, 369; Pillet, 1890, pp. 16, 53; Nolhac, 1908, p. 99, illus. facing p. 104; Helm, [19151, p. 214; Hautecoeur, [19171, p. 84; Blum, 1919, p- 59, illus. facing p. 60; A. P. de Mirimonde, "Musiciens isoles et portraits de 1'ecole franqaise du XVIIIE siecle dan les collections nationales," Revue du Louvre, No. 2, 1967, pp. 81-83, illus. p. 81.